Lion’s Mane mushroom is an edible fungus from the tooth fungus group also known as “Yamabushitake” or Hericium erinaceus. Native to North America, Europe, and Asia, Lion’s Mane is not only a well-regarded foodstuff but also used in traditional medicine for its medicinal properties. Lion’s Mane is uncommon in the wild, but because it takes well to cultivation, it is commonly used as a food source in Japan and China. For a meal, it can be sliced into steaks and simmered with butter and spices.de la Vega, J. (2015). An Important Introduction to Cooking Lion’s Mane Mushroom. Randwiches. Available at: http://www.randwich.es/blog/2015/10/19/pan-fried-lions-mane-mushroom [Accessed April 5, 2018]. For herbal remedies, it can be made into a tincture or ground into a powder.Lion’s Mane Mushroom: The Ultimate Guide (2017). ChagaHQ.com. Available at: https://chagahq.com/lions-mane-mushroom/ [Accessed April 5, 2018]. 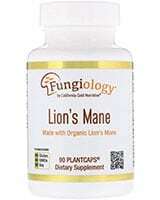 Recently, Lion’s Mane has come under scientific scrutiny for its neuroregenerative effects. Bench research, animal studies in nerve crush injuries, and human studies in early cognitive decline and depression all suggest that it may have potential to restore, or at least ameliorate cognitive and neurological deficits. 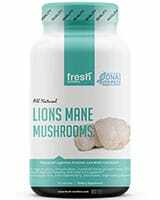 >> Looking to Buy Lion’s Mane Mushroom? Click here to see our recommended sellers. 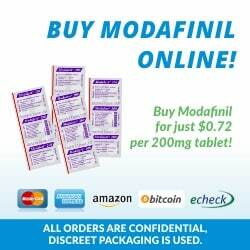 antibiotic, anticarcinogenic, antidiabetic, anti-fatigue, antihypertensive, antihyperlipidemic, anti-senescence, cardioprotective, hepatoprotective, nephroprotective, and neuroprotective properties and improvement of anxiety, cognitive function, and depressionFriedman, M. (2015). Chemistry, Nutrition, and Health-Promoting Properties of Hericium erinaceus (Lion’s Mane) Mushroom Fruiting Bodies and Mycelia and Their Bioactive Compounds. J. Agric. Food Chem. 63, 7108–7123. While Lion’s Mane has been in use as a traditional Chinese medicine therapy for gastritis for 1000 years,Ma, B. J., Shen, J. W., Yu, H. Y., Ruan, Y., Wu, T. T., and Zhao, X. (2010). Hericenones and erinacines: stimulators of nerve growth factor (NGF) biosynthesis in Hericium erinaceus. Mycology 1, 92–98. scientific examination of its therapeutic uses are more recent. Some of the most exciting science on the fungus involves its neuroregenerative effects. The current scientific buzz on Lion’s Mane is exciting because it may be beneficial in high-profile cognitive and neurological diseases which currently have no cure.Friedman, M. (2015). Chemistry, Nutrition, and Health-Promoting Properties of Hericium erinaceus (Lion’s Mane) Mushroom Fruiting Bodies and Mycelia and Their Bioactive Compounds. J. Agric. Food Chem. 63, 7108–7123. In the 1990’s, scientists found compounds associated with stimulation of nerve growth factor (NGF) synthesis (hericenones C–HKawagishi, H., Ando, M., Shinba, K., Sakamoto, H., Yoshida, S., Ojima, F., Ishiguro, Y., Ukai, N., and Furukawa, S. (1992). Chromans, hericenones F, G and H from the mushroom Hericium erinaceum. Phytochemistry 32, 175–178.Kawagishi, H., Ando, M., and Mizuno, T. (1990). Hericenone A and B as cytotoxic principles from the mushroom Hericium erinaceum. Tetrahedron letters 31, 373–376.Kawagishi, H., Ando, M., Sakamoto, H., Yoshida, S., Ojima, F., Ishiguro, Y., Ukai, N., and Furukawa, S. (1991). Hericenones C, D and E, stimulators of nerve growth factor (NGF)-synthesis, from the mushroom Hericium erinaceum. Tetrahedron Letters 32, 4561–4564. and erinacines A–I)Kawagishi, H., Shimada, A., Shirai, R., Okamoto, K., Ojima, F., Sakamoto, H., Ishiguro, Y., and Furukawa, S. (1994). Erinacines A, B and C, strong stimulators of nerve growth factor (NGF)-synthesis, from the mycelia of Hericium erinaceum. Tetrahedron letters 35, 1569–1572.Kawagishi, H., Shimada, A., Hosokawa, S., Mori, H., Sakamoto, H., Ishiguro, Y., Sakemi, S., Bordner, J., Kojima, N., and Furukawa, S. (1996). Erinacines E, F, and G, stimulators of nerve growth factor (NGF)-synthesis, from the mycelia of Hericium erinaceum. Tetrahedron Letters 37, 7399–7402.Lee, E. W., Shizuki, K., Hosokawa, S., Suzuki, M., Suganuma, H., Inakuma, T., Li, J., Ohnishi-Kameyama, M., Nagata, T., Furukawa, S., et al. (2000). Two novel diterpenoids, erinacines H and I from the mycelia of Hericium erinaceum. Biosci. Biotechnol. Biochem. 64, 2402–2405. in the fruit body and mycelium of Lion’s Mane. This discovery is notable because common neurodegenerative diseases like Alzheimer’s disease are associated with reduced cholinergic neurons in the brain.Ferreira-Vieira, T. H., Guimaraes, I. M., Silva, F. R., and Ribeiro, F. M. (2016). Alzheimer’s disease: Targeting the Cholinergic System. Curr. Neuropharmacol. 14, 101–115. Because NGF promotes the differentiation and survival of cholinergic neurons in the brain and spinal cord, it could theoretically be used to treat dementia.Ferreira-Vieira, T. H., Guimaraes, I. M., Silva, F. R., and Ribeiro, F. M. (2016). Alzheimer’s disease: Targeting the Cholinergic System. Curr. Neuropharmacol. 14, 101–115. However, the NGF protein itself is unable to cross from blood to the brain, so research is being carried out on low-molecular-weight compounds such as hericenones and erinacines that promote NGF biosynthesis.Ma, B. J., Shen, J. W., Yu, H. Y., Ruan, Y., Wu, T. T., and Zhao, X. (2010). Hericenones and erinacines: stimulators of nerve growth factor (NGF) biosynthesis in Hericium erinaceus. Mycology 1, 92–98. Because of its association with hericenones and erinacines, Lion’s Mane has been further evaluated in cell, animal and human studies for neuroregenerative effects. In 2007, aqueous extracts of Lion’s Mane were shown to stimulate neurite outgrowth in the NG108-15 cell line (an in vitro neuronal model composed of rat/mouse glioma cells).Wong, K. H., Sabaratnam, V., Naidu, M., and Keynes, R. (2007). Activity of aqueous extracts of lion’s mane mushroom Hericium erinaceus (Bull. : Fr.) Pers. (Aphyllophoromycetideae) on the neural cell line NG108-15. International Journal of Medicinal Mushrooms 9. However, a 2013 study which compared the neurite outgrowth from Lion’s Mane against that stimulated by other edible fungi, showed that it might not be the highest impact mushroom in this class, Lignosus rhinocerotis and Ganoderma lucidum had even greater effects.Phan, C.-W., David, P., Naidu, M., Wong, K.-H., and Sabaratnam, V. (2013). Neurite outgrowth stimulatory effects of culinary-medicinal mushrooms and their toxicity assessment using differentiating Neuro-2a and embryonic fibroblast BALB/3T3. BMC Complement. Altern. Med. 13, 261. A subsequent study done in 2015 to compared Lion’s Mane against Lignosus rhinocerotis. In this study both fungi performed roughly equivalent, stimulating neurite outgrowth in in vitro cells from the brain, spinal cord, and retina of chick embryos. However, Lion’s Mane exerted its maximum effects at a concentration of 50 µg/mL, while L. rhinocerotis had maximum effects at different concentrations depending on the tissue.Samberkar, S., Gandhi, S., Naidu, M., Wong, K.-H., Raman, J., and Sabaratnam, V. (2015). Lion’s Mane, Hericium erinaceus and Tiger Milk, Lignosus rhinocerotis (Higher Basidiomycetes) Medicinal Mushrooms Stimulate Neurite Outgrowth in Dissociated Cells of Brain, Spinal Cord, and Retina: An In Vitro Study. Int. J. Med. Mushrooms 17, 1047–1054. For those interested in specific mechanisms, a 2014 study examined neurite outgrowth in rat pheochromocytoma (PC12) cell lines. The authors measured NGF protein levels and evaluated secondary metabolites to conclude that Lion’s Man acted via hericenone E to stimulate the MEK/ERK and PI3K/Akt pathways.Phan, C.-W., Lee, G.-S., Hong, S.-L., Wong, Y.-T., Brkljača, R., Urban, S., Abd Malek, S. N., and Sabaratnam, V. (2014). Hericium erinaceus (Bull. : Fr) Pers. cultivated under tropical conditions: isolation of hericenones and demonstration of NGF-mediated neurite outgrowth in PC12 cells via MEK/ERK and PI3K-Akt signaling pathways. Food Funct. 5, 3160–3169. A 2014 study examining peripheral nerve regeneration in rats found that an aqueous extract of Lion’s Mane promoted early functional recovery. For adult female Sprague-Dawley rats with axonotmetic peroneal nerve injury, functional recovery was assessed by the Peroneal Functional Index (PFI) from walking-track analysis and toe-spreading reflex. Rats which were treated daily with the aqueous extract recovered several days earlier than untreated controls on both measures. One of the most exciting papers on Lion’s Mane was a 2011 paper looking at amyloid plaque formation in a mouse model for Alzheimer’s Disease. Mice were fed Lion’s Mane for 23 days, then the amyloid β(25-35) peptide which induces symptoms of dementia. 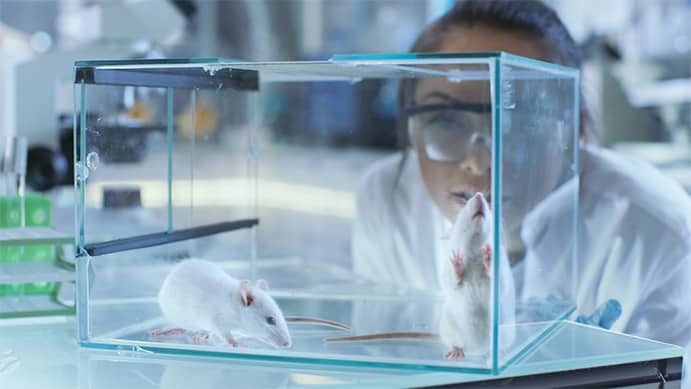 Mice treated with Lion’s Mane did not develop impairment of spatial short-term and visual recognition memory as compared to controls which indicated it may prevent dementia.Mori, K., Obara, Y., Moriya, T., Inatomi, S., and Nakahata, N. (2011). Effects of Hericium erinaceus on amyloid β(25-35) peptide-induced learning and memory deficits in mice. Biomed. Res. 32, 67–72. In a 2009 human study, Japanese scientists did a randomized placebo-controlled clinical trial of Lion’s Mane in patients aged 50-80 who were diagnosed with mild cognitive impairment. The results were exciting, patients who took four 250 mg tablets containing 96% Lion’s Mane dry powder three times a day for 16 weeks scored significantly above patients with placebo on cognitive scales after taking the supplement for 8 weeks (as measured by the Revised Hasegawa Dementia Scale or HDS-R). There were no adverse effects from the treatment although the effect did stop when the supplement was discontinued.Mori, K., Inatomi, S., Ouchi, K., Azumi, Y., and Tuchida, T. (2009). Improving effects of the mushroom Yamabushitake (Hericium erinaceus) on mild cognitive impairment: a double-blind placebo-controlled clinical trial. Phytother. Res. 23, 367–372. In a 2010 human study, Lion’s Mane was evaluated for its effects on menopause, depression, sleep quality and “indefinite complaints”. Thirty females took Lion’s Mane or placebo for 4 weeks. Scientist found that the group taking Lion’s Mane scored significantly lower on depression (as measured by the Epidemiologic Studies Depression Scale (CES-D)) than controls taking placebo. They concluded that H. erinaceus has potential as an antidepressant therapy.Nagano, M., Shimizu, K., Kondo, R., Hayashi, C., Sato, D., Kitagawa, K., and Ohnuki, K. (2010). Reduction of depression and anxiety by 4 weeks Hericium erinaceus intake. Biomed. Res. 31, 231–237. While the science on Lion’s Mane is still young, the fungi holds potential for targeted neurological therapies. As Lion’s Mane has been consumed as a foodstuff for centuries, and some human studies show cognitive benefit with no ill effects it seems like a reasonable dietary addition for those interested in food-as-medicine therapies. Hopefully Lion’s Mane will receive more scientific attention in future. Stay tuned for evolving research on the topic. 1. ↑ de la Vega, J. (2015). An Important Introduction to Cooking Lion’s Mane Mushroom. Randwiches. Available at: http://www.randwich.es/blog/2015/10/19/pan-fried-lions-mane-mushroom [Accessed April 5, 2018]. 2. ↑ Lion’s Mane Mushroom: The Ultimate Guide (2017). ChagaHQ.com. Available at: https://chagahq.com/lions-mane-mushroom/ [Accessed April 5, 2018]. 3, 5. ↑ Friedman, M. (2015). Chemistry, Nutrition, and Health-Promoting Properties of Hericium erinaceus (Lion’s Mane) Mushroom Fruiting Bodies and Mycelia and Their Bioactive Compounds. J. Agric. Food Chem. 63, 7108–7123. 4, 14. ↑ Ma, B. J., Shen, J. W., Yu, H. Y., Ruan, Y., Wu, T. T., and Zhao, X. (2010). Hericenones and erinacines: stimulators of nerve growth factor (NGF) biosynthesis in Hericium erinaceus. Mycology 1, 92–98. 6. ↑ Kawagishi, H., Ando, M., Shinba, K., Sakamoto, H., Yoshida, S., Ojima, F., Ishiguro, Y., Ukai, N., and Furukawa, S. (1992). Chromans, hericenones F, G and H from the mushroom Hericium erinaceum. Phytochemistry 32, 175–178. 7. ↑ Kawagishi, H., Ando, M., and Mizuno, T. (1990). Hericenone A and B as cytotoxic principles from the mushroom Hericium erinaceum. Tetrahedron letters 31, 373–376. 8. ↑ Kawagishi, H., Ando, M., Sakamoto, H., Yoshida, S., Ojima, F., Ishiguro, Y., Ukai, N., and Furukawa, S. (1991). Hericenones C, D and E, stimulators of nerve growth factor (NGF)-synthesis, from the mushroom Hericium erinaceum. Tetrahedron Letters 32, 4561–4564. 9. ↑ Kawagishi, H., Shimada, A., Shirai, R., Okamoto, K., Ojima, F., Sakamoto, H., Ishiguro, Y., and Furukawa, S. (1994). Erinacines A, B and C, strong stimulators of nerve growth factor (NGF)-synthesis, from the mycelia of Hericium erinaceum. Tetrahedron letters 35, 1569–1572. 10. ↑ Kawagishi, H., Shimada, A., Hosokawa, S., Mori, H., Sakamoto, H., Ishiguro, Y., Sakemi, S., Bordner, J., Kojima, N., and Furukawa, S. (1996). Erinacines E, F, and G, stimulators of nerve growth factor (NGF)-synthesis, from the mycelia of Hericium erinaceum. Tetrahedron Letters 37, 7399–7402. 11. ↑ Lee, E. W., Shizuki, K., Hosokawa, S., Suzuki, M., Suganuma, H., Inakuma, T., Li, J., Ohnishi-Kameyama, M., Nagata, T., Furukawa, S., et al. (2000). Two novel diterpenoids, erinacines H and I from the mycelia of Hericium erinaceum. Biosci. Biotechnol. Biochem. 64, 2402–2405. 12, 13. ↑ Ferreira-Vieira, T. H., Guimaraes, I. M., Silva, F. R., and Ribeiro, F. M. (2016). Alzheimer’s disease: Targeting the Cholinergic System. Curr. Neuropharmacol. 14, 101–115. 15. ↑ Wong, K. H., Sabaratnam, V., Naidu, M., and Keynes, R. (2007). 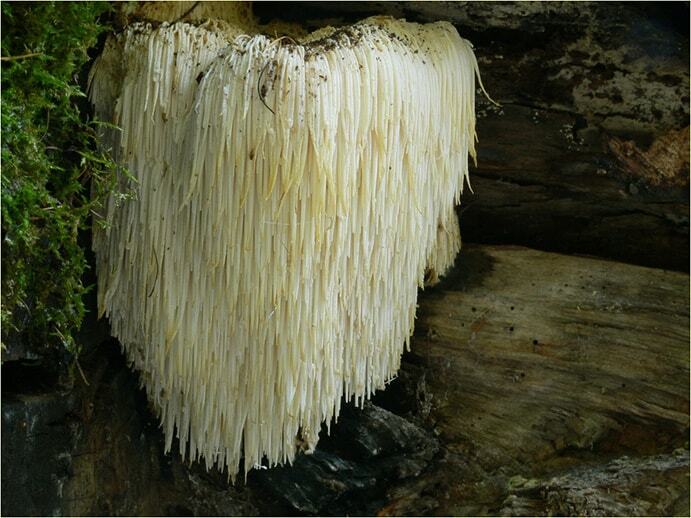 Activity of aqueous extracts of lion’s mane mushroom Hericium erinaceus (Bull. : Fr.) Pers. (Aphyllophoromycetideae) on the neural cell line NG108-15. International Journal of Medicinal Mushrooms 9. 16. ↑ Phan, C.-W., David, P., Naidu, M., Wong, K.-H., and Sabaratnam, V. (2013). Neurite outgrowth stimulatory effects of culinary-medicinal mushrooms and their toxicity assessment using differentiating Neuro-2a and embryonic fibroblast BALB/3T3. BMC Complement. Altern. Med. 13, 261. 17. ↑ Samberkar, S., Gandhi, S., Naidu, M., Wong, K.-H., Raman, J., and Sabaratnam, V. (2015). Lion’s Mane, Hericium erinaceus and Tiger Milk, Lignosus rhinocerotis (Higher Basidiomycetes) Medicinal Mushrooms Stimulate Neurite Outgrowth in Dissociated Cells of Brain, Spinal Cord, and Retina: An In Vitro Study. Int. J. Med. Mushrooms 17, 1047–1054. 18. ↑ Phan, C.-W., Lee, G.-S., Hong, S.-L., Wong, Y.-T., Brkljača, R., Urban, S., Abd Malek, S. N., and Sabaratnam, V. (2014). Hericium erinaceus (Bull. : Fr) Pers. cultivated under tropical conditions: isolation of hericenones and demonstration of NGF-mediated neurite outgrowth in PC12 cells via MEK/ERK and PI3K-Akt signaling pathways. Food Funct. 5, 3160–3169. 19. ↑ Mori, K., Obara, Y., Moriya, T., Inatomi, S., and Nakahata, N. (2011). Effects of Hericium erinaceus on amyloid β(25-35) peptide-induced learning and memory deficits in mice. Biomed. Res. 32, 67–72. 20. ↑ Mori, K., Inatomi, S., Ouchi, K., Azumi, Y., and Tuchida, T. (2009). Improving effects of the mushroom Yamabushitake (Hericium erinaceus) on mild cognitive impairment: a double-blind placebo-controlled clinical trial. Phytother. Res. 23, 367–372. 21. ↑ Nagano, M., Shimizu, K., Kondo, R., Hayashi, C., Sato, D., Kitagawa, K., and Ohnuki, K. (2010). Reduction of depression and anxiety by 4 weeks Hericium erinaceus intake. Biomed. Res. 31, 231–237.